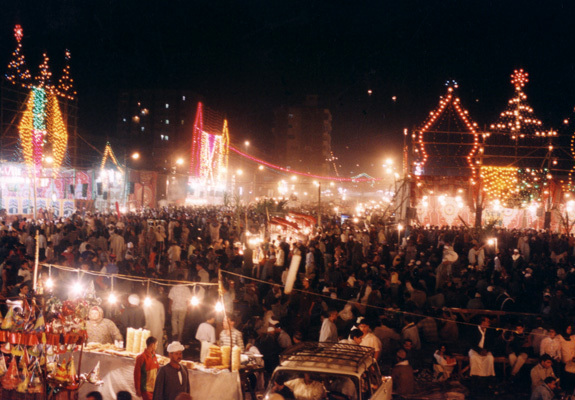 In 2007, Mawlid was celebrated by Sunni Muslims on March 31st. It was celebrated by Shi’as on April 5th. In the Gregorian calendar, the standard calendar of Western countries, the date moves each year, because the Islamic calendar is lunar, while the Gregorian is solar. In Arabic, Mawlid means “birthday” and Mawlid An-Nabi is one of the formal names given to the specific day to celebrate Muhammad, or in Shi’a Islam, the family of Ali in particular. Mawlid is the day when Sunnis and Shi’as mark the birthday of the Prophet Muhammad. In fact, the 12th of Rabi’ul’Awwal, or 17th for Shi’as, is traditionally believed to be the date of Muhammad’s death. It was arbitrarily fixed as the date to celebrate his birth, in 1207, when Muzaffar ad-Din Gökburi, brother-in-law of the famous Saladin. This year Isam Rasheed documented some of the celebrations in Adhamiya, where the Abu Hanifa Mosque is located. Because of the location of the Abu Hanifa Mosque, or Imam Adham Abu Hanifa Mosque, Sunnis from all over Baghdad, and even many provinces in Iraq used to travel to Adhamiya for the celebrations. This year, due to insecurity and on-going sectarian violence, it has become difficult for even Sunnis in Baghdad to make it to Adhamiya. Despite all of these difficulties Iraqis such as Qusay Al-Adhamiy and Waleed Tarek would not let the celebrations occur without the proper festivities. They each helped pay for the festivities in their area of Adhamiya by donating time and money. 1. One of the most tried and tested means of gaining the vision of the Noble Prophet (alayhi salat wa salam) during sleep, and even during wakefulness, is intense love for him, and occupying one’s thoughts with him night and day, along with faithful conforming with his noble sunnah, and frequent prayers of benediction (salawat) upon him in a continuous fashion, and complete uprightness on his way (istiqama) and great yearning towards seeing him (saw), and supplications for him, and carrying the cares of the Beloved (alayhi salat wa salam), namely, calling to Allah in secret and in public; and continual application of all of the foregoing, and the absence of despair and hopelessness in the mercy of Allah, the Generous Bestower, for He deals in a steady manner but does not neglect anything, nor does He ruin the hopes of anyone who supplicates Him and hopes in Him, and it might be that He has hidden the treasures within the “late” response to one’s supplication.